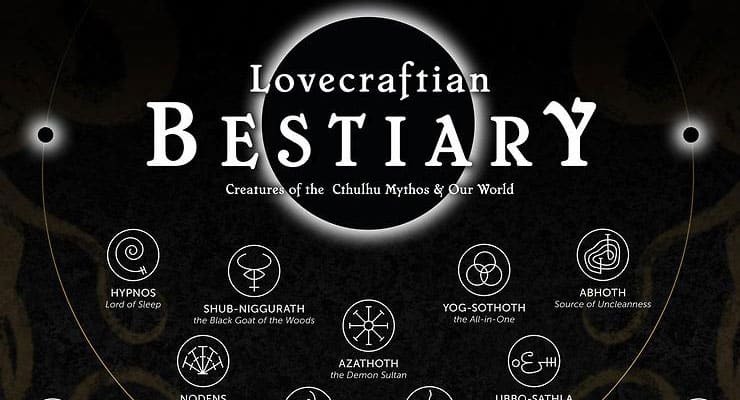 Check out this excellent map of H. P. Lovecraft’s Cthulhu Mythos creatures, from Elder Gods to Lesser Servitors! Via Myconfinedspace, here’s an excellent full-size map of H. P. Lovecraft’s Cthulhu Mythos beings, ranked by hierarchy. Lovecraft’s cosmic creations originated from deep space, some of whom had become the original gods of Earth. The pulp author saw the universe as an inherently alien and inscrutable place, completely oblivious to human life or ideas about how things should work. Lovecraft’s protagonists are always digging too deep into some conspiracy or another, only to lose their sanity and descend into gibbering wrecks when they discover that the cosmos is run by Giant Squid Monsters. 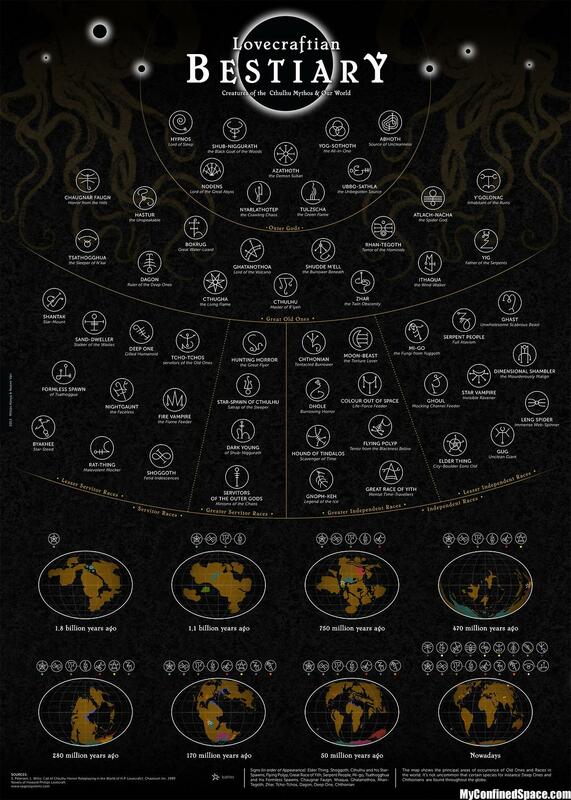 The map below—which ranks the Cthulhu Mythos beasties in order, from Outer Gods to Great Old Ones to the Lesser and Greater Servitor and Independent Races—would make a great poster. Not sure where the sigils for each being come from, though—one of the spurious Necronomicons, maybe? Lovecraft’s mythos, of course, has been a subject of total fascination for chaos magicians, many of whom have attempted applying the classic techniques of magick to actually summoning and communicating with Lovecraft’s imaginary beings—only to get results. The fact that these creatures are fictional is of little importance to chaos magicians: After all, the entire point of magick is understanding that everything is, ultimately, fictional, and that reality can actually be shaped and warped by applying new stories to it, particularly in altered states of consciousness. All of the primary techniques of magick are covered in Ultraculture’s free book and course on chaos magick—and you don’t have to just apply them to Lovecraft’s mythos. Magick can be used to interact with the classical gods, or even with gods, goddesses and spirits that you completely invent yourself. Why be content with somebody else’s model of reality—even Lovecraft’s? Make your own reality—and watch the incredible results pour in as you learn the basics of sorcery.